Arguably the biggest game in club football is the headline act of this weekend’s Spanish Primera Division program and the best bet is a simple one on a popular exotic market. 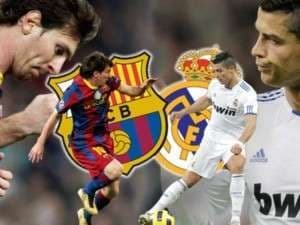 Backing both Real Madrid and Barcelona to score in matches played under the Clasico banner has been the equivalent of writing one’s own cheque in recent years and one does not see any reason to neglect the tried-and-trusted approach when the Meringues and Barca meet in Madrid on Sunday. Boylesports are offering odds of 1.53 for both teams to score, and that is too good to turn down. Both teams have scored in each of the last 14 El Clasico games since Barcelona, despite playing with one fewer man than Real Madrid for 16 minutes, beat its rival 2-0 in a UEFA Champions League clash at the Santiago Bernabeu in April 2011. And 12 of those 14 matches have gone over two and a half goals for punters who like that exotic line. Real Madrid has scored in all bar two of its 45 games across all competitions this season. Barcelona has scored in all except five of its 46 games across all competitions this season. Neither Real nor Barcelona boasts a good defence, at least in comparison to the power of its offence. A goalless draw, which is trading at odds of 19.00 with BetVictor, seems unlikely even if both goalkeepers have blinders. If backing both Real Madrid and Barcelona to score is the pick of the odds-on bets, backing the Meringues to extend their Spanish Primera Division advantage over Barca to an extremely healthy seven points is the best of the punts at odds against. Boylesports is out on its own in offering odds of 2.40 about Real winning El Clasico. Those are crazy odds. Real deserve to be quoted at odds around the 2.20 mark. The 29th round of the Spanish Primera Division championship kicks off with Celta hosting Malaga and it throws up a value bet in the shape of the home side. Celta crushed Malaga 5-0 in the reverse Spanish Primera Division fixture and, even though Celta’s home record is the equal worst in the top flight, Malaga’s away record is even less impressive. Clearly bookmakers, including Coral and Stan James, have taken the view that Celta is a Spanish Primera Division team well worth laying at odds of 2.10 to win a home match. One would not be all that interested if it was not for the fact that Celta dominated its away game against Malaga from start to finish and without external assistance – it was 11 versus 11 for the full duration – and Malaga is famous for being a soft touch on the road. Malaga has won a pathetic two of its last 21 away matches across all competitions. Finally, similarly to Celta, Valladolid enjoyed an emphatic victory in Spanish Primera Division’s 10th round and it is attractively listed at odds of 2.45 with BetVictor to get the better of Rayo Vallecano for the second time this term. Valladolid walloped Rayo Vallecano with three goals in the space of 18 minutes either side of the half-time interval. Furthermore, Valladolid’s last Spanish Primera Division home game resulted in a 1-0 win over Barcelona, the same Barca side that thrashed Rayo Vallecano 6-0 last month. One is not trying to paint over Valladolid’s cracks, of which there are many. Valladolid is 18th on the Spanish Primera Division ladder for a number of good reasons. But Rayo Vallecano is just three points in front of Valladolid and it travels knowing that it lost the reverse fixture 0-3. Betting is all about obtaining value and Valladolid should be shorter odds than 2.45, with 2.25 being fair enough.